Aneroid Bellows: For installations where maintaining the desiccant tube of your vented sensor in a timely fashion is difficult, Seametrics offers an Aneroid Bellows kit to replace your standard desiccant tube. Rather than breathing air through the desiccant, the bellows seals off the air in the vent tube and will expand and contract in response to atmospheric pressure changes translating that change to the air sealed in the vent tube. This eliminates any moisture entering the cable while still compensating for atmospheric pressure. Desiccant Tube Refill Bottle: This bottle of indicating desiccant beads is available to refill your desiccant tubes once the original desiccant is spent (desiccant will turn from dark blue to pink). Each bottle provides roughly 18 refills. Desiccant Tube Replacement: Something come along and damage your desiccant tube between services? Has the tubing become cloudy or worn obscuring your view of the desiccants color change? Replacement desiccant tubes are available if your tube is beyond the point of simply refilling. Modbus/SDI12 Flying Lead: This adapter cable connects to our standard Smart Sensor cable connector and provides both bare wiring, and a connector for use with your USB/RS485 communication cable. 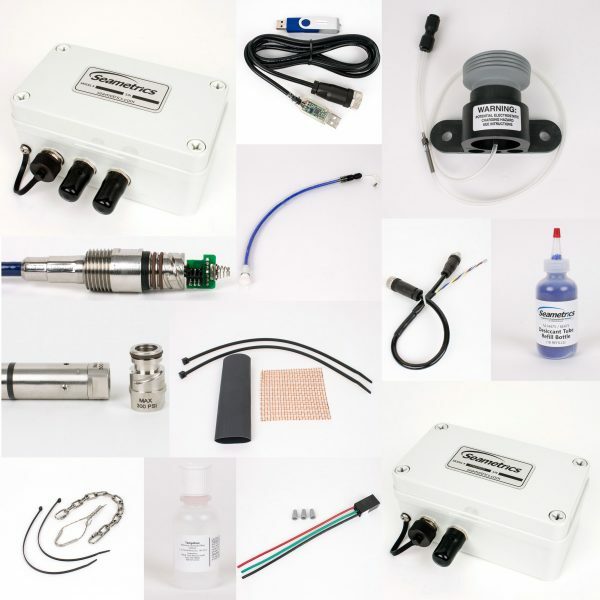 This allows your Smart Sensor to be wired into a 3rd party data logger or telemetry system while maintaining the ability to connect with Aqua4Plus when needed without having to mess with any wiring. ½” MNPT Threaded Top Cap: This option replaces the standard top cap on any of our cabled sensors. The ½” MNPT threads allow the sensor to be installed in a pressurized pipe system, or tank, using a standard FNPT port. Smart Sensor Junction Box: Easily junction multiple Smart Sensors to a single USB/RS485 connection using standard cable connectors. The Junction Box comes with 2 sensor connections with up to 7 connections available for creating small sensor networks when needed (up to 2000’ of cable total). Lightning Protection Kit: For use with our 4-20 mA analog sensors, the Lightning Protection Kit provides surge protection of the current loop for installations prone to nearby lightning strikes or power surges. Auxiliary Power Box: This power supply uses 8 user replaceable AA batteries to provide 12vdc power to your Smart Sensor, as well as pass-through communications using our standard USB/RS485 communication. This can be used to power both our 12vdc sensors (Turbo, DO2) or to provide additional power capacity to our other Smart Sensors (PT2X, CT2X, TempHion). Additional connections are also available providing a powered junction box. ¼” FNPT End Cone Adapter: This adapter replaces the standard solid end cone of our various pressure sensors with a ¼” FNPT thread, while sealing off the pressure inlets. This allows any of our pressure sensors to be threaded onto a standard MNPT port to monitor line or tank pressures up to 300 PSIG. USB/RS485 Communication Kit: Use this communication cable with all Seametrics Smart Sensors and our Aqua4Plus software for setup, download, calibration, and real-time data acquisition on up to 2000’ of cable. Kit includes our compact USB/RS485 communication cable, USB stick with software (also available on our Downloads page), and documentation. Transducer Strain Relief Kit: This kit is recommended to hang our standard sensor cables from an anchor point. Installs easily by wrapping around the outside of the cable jacket where needed to ensure your sensor not only stays in place, but ends up back in the correct position after being pulled for servicing. Since our standard sensor cables feature both braided shielding and Kevlar reinforcement no additional support is needed even in wells upwards of 1000’ deep. Anti-Fouling Kit: Experiencing bio-fouling on site affecting your data and requiring frequent cleaning? Getting ready to install sensors at a site known for such bio-fouling? Make sure to pick up one of our Anti-Fouling kits to inhibit that pesky growth. With copper mesh to protect your water quality sensor, and a copper insert to protect your pressure inlets, you can reduce the impact on your data and service routine. TempHion Reference Electrolyte: Our proprietary reference electrolyte combined with our unique reference electrode design provides some of the longest deployment times in the industry. Used in both our pH/ORP and Bromide TempHion sensors providing up to 6 months of operation between refills.